Phillip Anthony’s black and white seascapes invite the viewer to add the color of their own memories. The light from behind the dramatic clouds over the ocean—is it the full moon setting in a silver blue glow, or is it a tropical sunrise brilliant with cerulean and fuschia, just like the one you saw on your honeymoon? That is left for the viewer’s response. A completely self-taught artist, Phillip Anthony was born in California and grew up in a small town in Idaho. 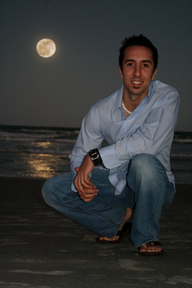 Phillip studied film and video production in college, then taught himself to paint after moving to Florida in 1998. The first black and white seascapes hit a chord with collectors when they were first exhibited in 2006. When his first two major gallery shows nearly sold to the walls, he knew he had found his style.